As part of new initiatives from Google for small business owners (well, big business owners also ok), Google recently launched Grow with Google campaign. 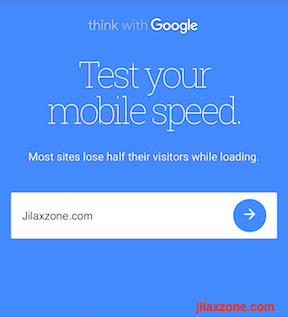 One of the tool Grow with Google offers is “Test Your Mobile Website Speed and Performance”, because like it or not, nowadays people connect to internet more from their mobile devices rather than computers. Counted in as mobile devices are smartphones, tablets, phablets, including smart screen like Amazon Echo Show. Before continuing further, do your website even has its mobile version? Well, if you don’t, then pity you. You should. Well, in fact you must have it. I won’t discuss here now how to create or get mobile version of website, but probably next time. Once you get it, then use this tips to get it checked. Be it a blogger, a small business owner, YouTuber, Podcaster, Social Media influencer or whatever you are, as long as you have (accompanying) website with you, then you have to make sure your website, especially mobile website – for the reason stated above – is up to speed, apart from keep generating great contents. Why you should even care or bother? Because what Google is saying is right, half of the potential visitors are lost during loading. So while content is king but speed and performance are the gatekeeper. If the website takes too long to load the web page, very likely they will first shift to some other things and in the end forget about your website. So make use of this Grow with Google Test Mobile Website tools to test where is your website rank in terms of speed, and in case you are not the fastest on the market, the tool will give you some tips and tricks to make your website up to speed. After all these checking, it will come out with a 3 pages dashboard: the test summary, the comparison result with similar sites, and last is suggestions how you can make the website better in speed and performance. FYI. I tried open the URL from computer, but it seemed the tool didn’t work on a computer but mobile devices only. This is my result, how is yours? Here’s my result when checking jilaxzone.com. How about your website? Have it checked now and get suggestions how to improve your website – especially mobile website – speed and performance. All for FREE!